It's 8:30 a.m. A packed subway train crawls toward Manhattan from Brooklyn. 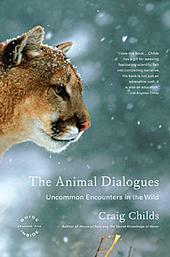 I'm pushed on all sides, smashed against the door reading Craig Childs' newest set of essays, "The Animal Dialogues." Tears well in my eyes as I read about a perfect blue shark dying on a desolate beach. For those of us pressed into spaces devoid of anything resembling the natural world, these stories invoke all that we are missing: the space, the sky, the awe at witnessing animals in their element; the wonder, the pure heart-stopping fear. While these essays may not bring tears to most readers' eyes, they do dwell in the emotional realm. Combining science, history and lyricism, Childs articulates sublime and untenable moments, those "stop and pay attention because this will never happen again" moments with a cast of likely and unlikely characters. A well-seasoned naturalist, writer and commentator, he offers private moments in the animal world in locations ranging from the Sonoran desert in Northern Mexico to British Columbia. Whether writing about likely creatures such as the bear, mountain lion, coyote, dog and cat, or the unlikely _ squid, rainbow trout, red-spotted toad, a long-extinct camel and the like _ Childs approaches and ponders each equally. He gives as much of his curiosity to the magic of a sea lion looking in from the waves as to the lonely wasp building a nest for a swarm that never arrives. It's quite tempting to skip to the furry favorites, but it's the "lesser" creatures _ the bugs and birds _ that provoke an intense response. For someone who is loved by mosquitoes, reading Childs' essay on the swarms that attacked him and his companion while canoeing through Canada's Yukon Territory produced a visceral, cringe-inducing reaction. The essays, some of which appeared in his book "Crossing Paths" (1997), are personal and carry a certain degree of sentimentality. He is a poetic writer; every word feels seeped in his love and respect for wild creatures and their homes. This affection, though, can become overwhelming. Childs advises in an author's note that the reader may want to take these essays one at a time and that is good advice. The essence of each creature, our often vicarious experience of them and Childs' prose warrant a little rumination before jumping to the next story. Though his musings at times teeter on the edge of becoming slightly over-the-top, he proves to be an unflinching realist. The animal world is not a place designed with humans in mind. We may feel it spiritual, we may "find ourselves" when walking through a vast desert, but we, for once, are not at the center. In the blue shark essay he writes, "I will tell you this of the animal spirit: it will tear you in two as quickly as it will bring you to wholeness." As wild spaces become increasingly distant and animals increasingly threatened in their natural environment, Childs' continuing narrative of his "uncommon encounters" is all the more trenchant. Calmly intruding into this world with Childs, witnessing the singular moment "so vivid that it detaches from time," each species' individuality shines, as do their similarities - humans included. Thank you Sara Rose for this beautiful piece.